Find energy-efficient ideas to make your home more beautiful for the holidays and every day. All in this issue of BRIGHT IDEAS. Install tape lights around windows or other accent areas. The lights are on flexible self-adhesive tape and are available in various colors as well as white. Wrap a grapevine ball in holiday lights and set in a large urn. Better yet, group a cluster of differently sized lighted bulbs for a pretty display. Hang paper snowflakes (cut with the kids, of course, and from cardstock) from string in an archway. Dig small holes in snow along a walkway and light candles for a nighttime path. Group different heights of candles on a plain piece of red felt for a table topper. Hot glue holiday cards along a length of wide ribbon and hang to the side of a doorway. W.A.C. Lighting’s energy-saving InvisiLED tape lights, pictured above, use the latest LED Technology and have a life expectancy of up to 50,000 hours. Turn holiday light into holiday smarts with these five money-saving tips that will also benefit the planet and help spread light in your community. Purchase LED Christmas lights. This year is the first year that decorative light strings are available in Energy Star-qualified versions, which last 10 times longer than traditional strands. They also translate to as much as 90-percent savings on your energy bill. Although the lights are more expensive than traditional holiday lights, they will pay for themselves in a relatively short time frame and conserve energy. Put all your holiday lights on timers. Your house is safer and more energy efficient. Use 4-watt lightbulbs for window candles instead of 7-watt bulbs. Display window candles just in the front of your house. Did you know that traditional incandescent bulbs actually increase the heat level in a home? Take this example: In one large house, 10 incandescent lightbulbs equals 1,000 watts of power consumption-which means 900 watts as heat. “That’s like operating a small space heater inside house,” says Energy Star’s Baker. Twenty percent of residential energy consumption is for lighting, says Alex Baker of Energy Star. One of the quickest ways to cut that budget bite: Replace one incandescent bulb with one Energy Star-qualified CFL. That will save $30 or more in electricity cost over the lifetime of the bulb. Replace five of the most frequently used fixtures or bulbs with ones that have earned the Energy Star rating; you’ll save $70 per year. “If every American did that, we would all collectively save $8 billion a year in energy costs,” Baker says. Monitor your energy usage: Buy an electricity monitor or power strip that monitors energy watts used. Most are relatively inexpensive and will enable you to assess efficiency in your own home. Install a dimmer. While it’s difficult to quantify, says Baker, most dimmers will prompt homeowners to lower the light level, which will in turn save energy. Lower your thermostat: Just one degree can save you one percent on your monthly energy bill. Lower your water heater gauge: Ten degrees less on your water heater can save you 3 to 5 percent on your water heating bill. Lutron’s Maestro Countdown Timer Switch (on left) is ideal for exhaust fans and can be set to shut off automatically. Lutron’s Maestro Electronic Dimmer (on right) features gradual fade on/off for maximum energy efficiency. SHORT-TERM: Add another layer of light. If a room has an overhead fixture and task lighting, consider an accent piece focused on artwork, plants or in a shadow-filled corner. You’ll enhance the room’s design with little cost. LONG-TERM: Using CFLs in sockets once intended for incandescent bulbs is essentially retrofitting fixtures and lamps-which is fine. But for room additions or renovations that genuinely embrace the money-saving potential of lighting, the best way to go is Energy Star-qualified light fixtures. 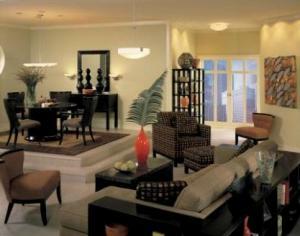 Most offer families of coordinated light fixtures to outfit a whole room. In fact, there are 16,000 qualified light fixtures, says Baker. LONG-TERM: Homeowners can also take advantage of an Energy Star Advanced Lighting Package. “More than 60 percent of fixtures installed in the home are that of Energy Star-qualified variety,” says Baker.